After seeing his own portrait and bio added to the new Hall of Fame exhibit at Vail Village’s Colorado Snowsports Museum in October, Warren Miller Entertainment ski film star Chris Anthony seemed starstruck himself. More than the 28 Warren Miller films he’s starred in, the nine World Extreme Skiing Championships he’s competed in (and the Alaska Extreme Skiing Championship he won in 1996), the thousands of elementary schoolkids he’s inspired with his Chris Anthony Youth Initiative Project motivational speaking junkets, the backcountry enthusiasts he’s guided in Alaska’s Chugach Mountains every spring since 2000 with Points North Heli-Adventures, the skiing and cycling tours he’s led through Austria, Italy, and Slovenia every winter and most summers for the past 20 years. That last bit of biography has become entwined with what Anthony hopes will be his most enduring contribution to the sport of skiing: Telling the story of the 10th Mountain Division, the elite squadron of Army infantrymen who trained at nearby Camp Hale and deployed as America’s first ski troopers during World War II. First, with Climb to Glory: Legacy of the 10th Mountain Division, a 2014 documentary that detailed the rigors of life at Camp Hale, which Anthony co-produced and also starred in, skiing in World War II–era gear with Tony Seibert, grandson of Vail’s founder, who tragically died in an avalanche in the East Vail Chutes that year. And now with Mangart, a Climb to Glory sequel that he’s producing, directing—and financing, with donations—on his own. “This whole documentary has kind of fallen in my lap, and things keep happening for a reason,” he says of the fortuitous series of events that have led to the making of Mangart. Starting with a retired general from the Slovenian Armed Forces who had seen Climb to Glory, tracked him down at a hotel in Valbruna, and left him a manuscript, a lost historical chapter recounting the 10th’s exploits in that corner of the world during the final days of the war; the denouement: after routing the Germans from redoubts atop Mount Belvedere and Riva Ridge, America’s mountain troopers celebrated VE Day by staging a ski race on a glacier they had spied on the slopes of a mountain on Italy’s border with the former Yugoslavia. That just resonated with him. 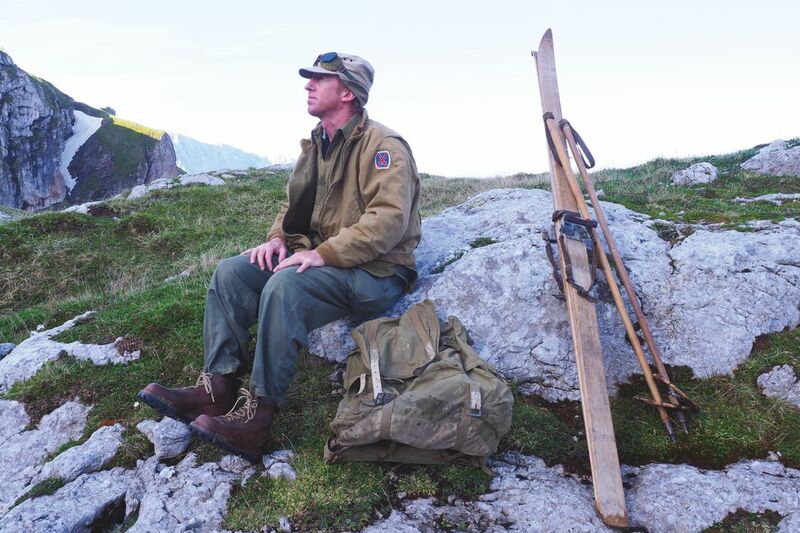 With logistical support from the US Embassy and NATO (which provided a helicopter for scouting locations), Anthony secured permits to film on Slovenia’s 8,789-foot Mount Mangart (now a national park) in the summer of 2018. After two weeks of incessant rain, the permitted filming day in May dawned with a clear blue sky. Avalanches and rockslides had closed the road to Mount Mangart, but villagers cleared the way as far as they could. After two hours of marching uphill with a camera crew and more than a dozen veteran and current Slovenian mountain troopers in period costumes, Anthony was finally there. Standing on that historic spot, he spent an entire day directing, re-creating every detail of that seminal race. It was a life-changing perspective that makes his quest to raise the $100,000 he’ll need to realize his dream of debuting the educational film—which, like Climb to Glory, will always screen for free—in Vail on the 75th anniversary of the race on June 3, 2020, seem much less daunting. 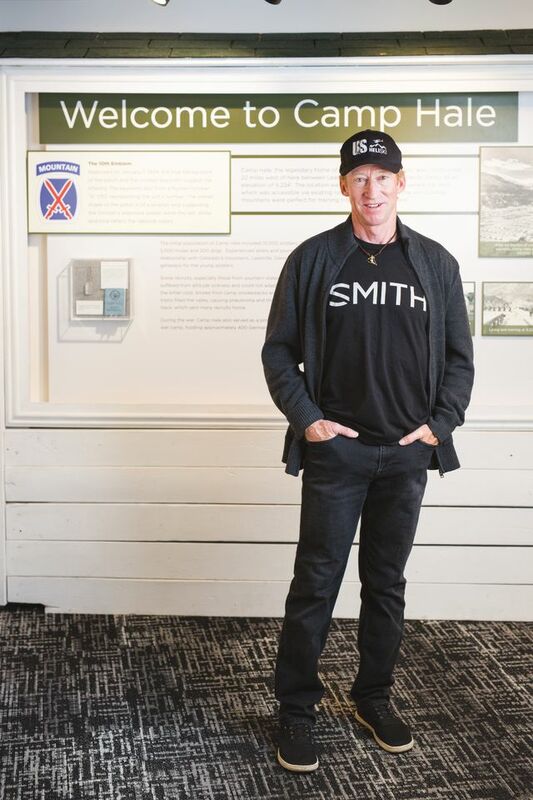 Want to immerse yourself in the history of the 10th Mountain Division in the company of ski trooper documentarian Chris Anthony? Hosted by Avon’s Westin Riverfront Resort, Anthony’s 10th Mountain Division Ski Trooper Experience (Jan 18–21, $699/night first adult, $299 each additional adult, includes accommodations but not lift tickets; (westinriverfront.com) starts with a cocktail party and screening of Climb to Glory at the Westin on Friday night, followed on Saturday by a day on the slopes with Anthony at Ski Cooper near Leadville (where 10th Mountain Division ski troopers practiced carving their turns) and a visit to the 10th’s historic training grounds, Camp Hale. On Sunday, after skiing Riva Ridge—Vail Mountain’s longest and finest run, dedicated to a historic battle fought by 10th Mountain Division soldiers—the day concludes with a visit to Vail Village’s Colorado Snowsports Museum, where the centerpiece of a $2.6 million renovation is a new exhibit chronicling the history of the 10th; the tour concludes on Monday with a day at Beaver Creek, skiing the Birds of Prey World Cup downhill with Anthony. Not able to join the fun? To support Anthony’s self-funded Mangart documentary, click the red “Donate” button at chrisanthony.com/youth-initiative-project.